Case Management - Control and track cases by creating cases automatically and/or manually. The System sends a notification to available staff within proximity to the location of the case. The System then retrieves all responses from available staff and analyzes all responses in order to select the closest staff available and then assigns the case to that person. The System registers assigned personnel and controls check-in and check-out time and stores case reports from the case location. All case activities are stored in the system which allows for administration, configuration and monitoring capabilities, as well as management and analytical reports. System is designed to be integrated with other systems in order to generate cases automatically, share case details, collected information and provide time tracking proficiency. System provides self-service portal for staff and clients. 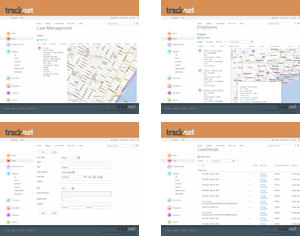 Staff Management - Manage staff by tracking work time, activities and locations of staff. 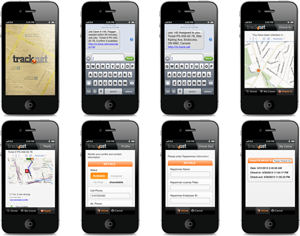 System tracks the location of available staff via the GPS feature of their smartphones. It also allows them to collect data in the field, such as repair team case details via text input forms (case reports). System assigns cases automatically to the staff members based on closest location and availability. System provides driving directions to the location, checks traffic and estimates distance and arrival time for staff. System also records check-in and check-out time of the staff and the ticket number at the case location. System allows staff to update their profile and status. Back-office and dispatch communicate with staff by using messaging and web technologies. © 2013 Track.Net | Beau Dietl & Associates All Rights Reserved.